Norman Finkelstein’s last book, This Time We Went Too Far, was published by new figure on the scene. OR Books. “We have been attacked while in international waters. That means the Israelis have behaved like pirates … The moment they start to steer this ship towards Israel, we have also been kidnapped. The whole action is illegal.”—Henning Mankell, aboard the Gaza Freedom Flotilla Eastern Mediterranean, Monday, May 31st, 2010, 4.30am: Israeli commandos, boarding from sea and air, attack the six boats of the Gaza Freedom Flotilla as it sails through international waters bringing humanitarian relief to the beleaguered Palestinians of Gaza. Within minutes, nine peace activists are dead, shot by the Israelis. Scores of others are injured. The 700 people on board the ships are arrested before being transported to detention centers in Israel and then deported. Within hours, outrage at Israel’s action echoes around the world. Spontaneous demonstrations in Europe, the United States, Turkey, and Gaza itself denounce the attack. Turkey’s prime minister describes it as a “bloody massacre” and “state terrorism.” Lebanon’s prime minister calls it “a dangerous and crazy step that will exacerbate tensions in the region.” In these pages, a range of activists, journalists, and analysts piece together the events that occurred that June night, unpicking their meanings for Israel’s illegal, three-year-long blockade of Gaza and the decades-long Israel/Palestine conflict more generally. 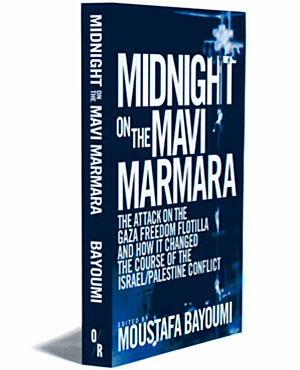 Mixing together first-hand testimony, documentary record, and illustration, with hard-headed analysis and historical overview, Midnight on the Mavi Marmara reveals why the attack on Gaza Freedom Flotilla may just turn out to be Israel’s Selma, Alabama: the beginning of the end for an apartheid Palestine. Contributors include: Omar Barghouti, Max Blumenthal, Juan Cole, Sara Roy, Norman Finkelstein, Glenn Greenwald, Rashid Khalidi, Alia Malek , Lubna Masarwa and Raja Shehadeh.